The Gallery Hotel is located in the central financial district in Singapore. The building is a large cement block with thick colourful windows sills and on the inside the hotel has many murals and paintings. The hotel has 222 rooms, and there are several types of rooms. There are several twin rooms and double rooms, and each room has its own bathroom with a shower. The beds are covered with white covers and colourful cushions. Each type of room has its own style and decorations. The hotel has colourful lights and murals that decorate the halls. There are several floors that were designed for women, where the room service consists only of women. 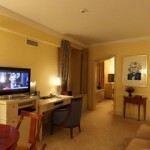 Each room has a flat screen television set and access to the hotel’s WiFi. The standard rooms are the Gallery double rooms. There are Gallery rooms with a large double bed and rooms that have twin beds, and there are bathrooms with a bathtub and bathrooms with a shower. There are two types of Glazzhaus rooms, those that have two twin beds and those that have a double bed. In each bathroom there is a bathtub. These rooms have floor to ceiling windows and views towards the hotel’s swimming pool. The Bookend Club rooms are larger rooms with a kingsize beds, and guests can choose between having a room with a bathtub and having a room with a shower. These rooms have views towards Singapore river, an historical canal. 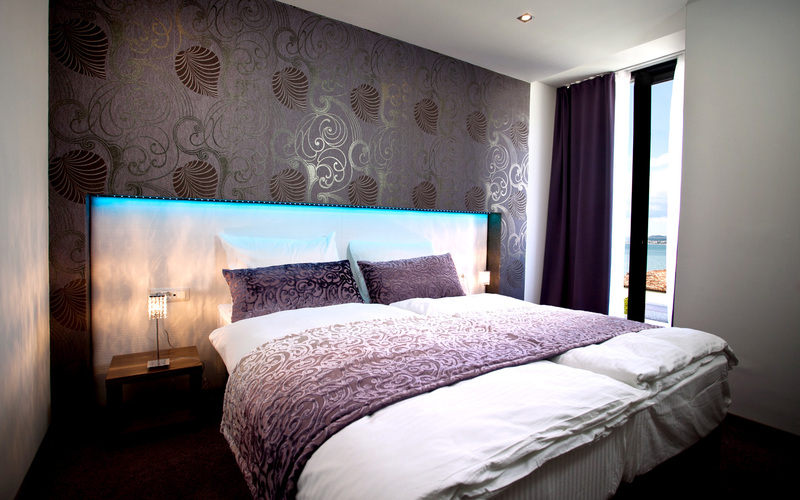 The Observatory Suites are rooms with a large kingsize bed and a separate living room. Each bathroom has a bathtub and a shower. These rooms have a minibar, their own telescope and views towards the canal. 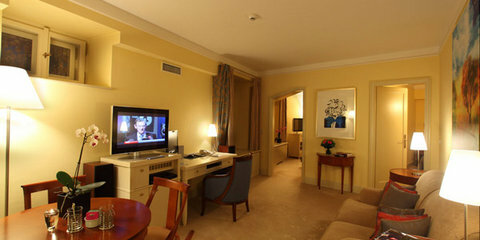 The Executive Suites are large suites with a separate room and living room. The living room has wooden furniture and colourful decorations. These rooms have a minibar, views towards the river and bathrooms with a bathtub and a shower. The Zenden restaurant is the hotel’s main restaurant, a dining hall where guests will be able to enjoy many regional dishes. The Zenden Lounge is a bar area known for its cocktails. The eM Café and Bar is located on the banks of the canal. Guests will be able to enjoy live concerts and DJ’s. The Bar 84 is another one of the hotel’s bars, where guests will be able to watch a Japanese magician’s show. Sapporo Ramen Miharu is a Japanese restaurant where visitors will be able to enjoy many types of noodles. The Sapporo Shochu Dining Bar is a bar where guests will find more than 100 types of shochu, a local drink that can be accompanied by traditional dishes from the region of Tokyo. The other Japanese restaurant is Okinawa Mimigar, where guests will be able to taste authentic food from Okinawa island. The hotel’s swimming pool is located on the roof. The designer pool has views towards the city center. Gym 360 is a gym with several weight lifting areas, a kickboxing area, a yoga hall and a juice bar. The hotel’s spa is Ayuthaya, where guests will be able to enjoy authentic Thai massages. 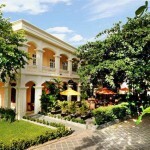 The spa offers many treatments, some of which used to be available to Thai Royalty. Luvur Nails is a mani and pedi center where guests can have foot massages. There are several conference halls and a banquet hall in the hotel. On the second floor guests will find a business center with several desktops, photocopying machines and printers. The hotel offers a transport service from and to the nearest airport. The hotel is located in the center of Singapore, in Robertson Quay. A short distance away from the hotel is Orchard Road, one of the city’s main streets, filled with bars, restaurants and shops. This colourful hotel is located next to one of the city’s historical canals. Near the hotel guests will find Clarke Quay, a district filled with bars and restaurants. Guests will be able to shop on Orchard Road, visit the Chinatown area and tour the city, known for its colonial architecture and glass buildings. 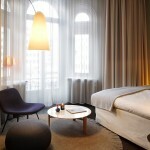 The Rough Luxe Hotel is located in the center of London. This hotel has an abandoned, rough, worn out look and designer decorations. The hotel has double rooms with their own wash basins. 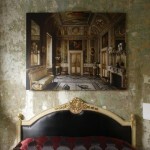 The rooms have bare walls decorated with paintings in golden frames, frayed carpets and carved furniture. The bed and breakfast has an abandoned look, antique furniture and art pieces. 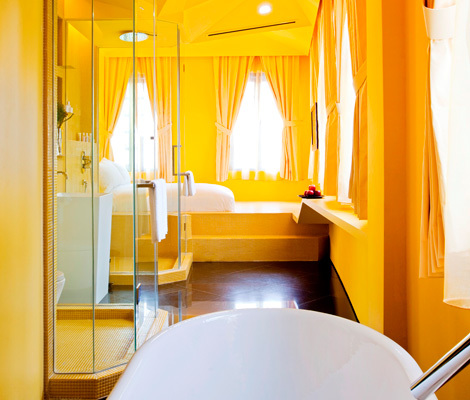 There are several double rooms and some of the rooms have their own private bathroom with a bathtub. 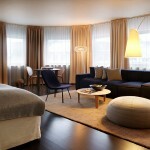 Guests will be able to choose the designer bed linen and the art pieces that they want in their rooms. The bathrooms have handmade products. Part of the rooms are connecting rooms that can be connected, forming large family suites. Each room has Internet access. 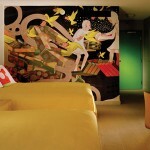 Many of the artists who designed this hotel stay at the hotel. There are many art pieces and sculptures that can be seen around the hotel. Room 1 is a small room with a double bed and a private bathroom. This room is decorated with designer lamps with colourful lampshades, a painting of a red flower and a painting of the Palazzo Altieri in Rome. Price is around 254€ per night. Room 2 has a large double bed. The room is decorated with a painting of a Geisha that used to be the front cover of a novel. For 227€ per night this room has a shared bathroom, and for 316€ per night it can have its own bathroom. Room three is a smaller room with a double bed. There is a painting of several dancers, a sculpture and a hand carved desk with a chair. Price is 227€ with a shared bathroom and 316€ with a private bathroom. Room 5 is a large room with a kingsize bed and its own bathroom. There are two paintings of bright red flowers, a painting of a solstice and an antique chandelier. Price is around 316€ per night. Room 6 is a double room. On the worn walls there is a painting of a Lady in a Kimono. Price is 226€ per night with a shared bathroom and 316€ per night with a private bathroom. Room 7 has a double bed. 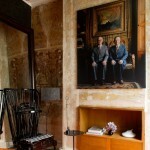 The room’s main decorations are a painting of the Marquess of Bath and an ancient lampshade. Price is 227€ with a shared bathroom and 316€ with a private bathroom. Room 8 has a kingsize bed. The bathroom has a large copper bathtub. This room is decorated with antiques and designer lamps. Price is around 368€ per night. Room 9 is another room with a kingsize bed. This room has a cowboy theme. 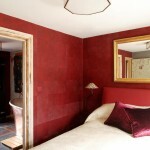 Price per night with a shared bathroom is 227€ per night and price per night with a private bathroom is 316€ per night. Room 10 is one of the hotel’s largest rooms and has a kingsize bed. This room is decorated with dated paintings of cowboys and has antique furniture covered with red material. Price is 227€ with a shared bathroom and 316€ per night with a large private bathroom. Guests will be able to enjoy breakfasts at the hotel’s restaurant. The restaurant only serves breakfast, and there are many bars, cafés and restaurants near the hotel that serve lunch and dinner. The hotel staff can make table reservations. The restaurant has tall ceilings decorated with wooden panels. The restaurant has a vintage décor with antique paintings, many lamps and vases. The hotel has several beehives on the roof. The bees live in bee hives designed by one of the hotel’s artists in residence. There is a beekeeper who looks after the bees. Guests will be able to enjoy fresh honey made at the hotel. The hotel is located in the center of London. Near the hotel there are many bars, cafés and restaurants, and many of these offer ethnic dishes. 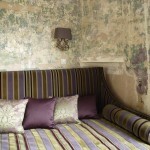 This designer hotel has worn out walls and antique furniture covered in silk. There are many sculptures in the hotel. The hotel’s philosophy is about appreciating the beauty of rugged buildings and old furniture, and moving away from high tech designs and brands. The hotel is connected to The Mews Contemporary Art Gallery. Inside this large cultural center guests will be able to enjoy a selection of coffees and teas accompanied by fresh pastries served in the tea room. 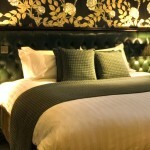 Covent Garden and Oxford Street are within walking distance of the hotel. Guests will be able to explore the city’s main landmarks and monuments. The hotel is located near King’s Cross station. King’s Cross and St. Pancras connect this district to the rest of the city. The Gala Split Hotel is located in the city of Split, in Croatia. 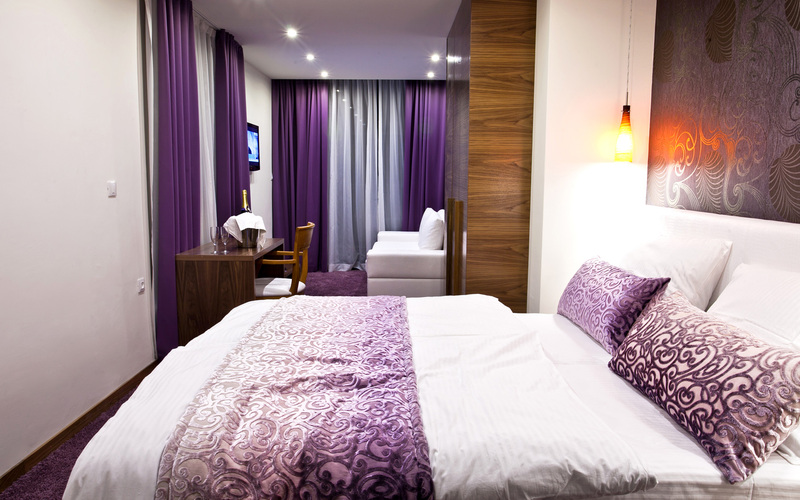 The hotel has purple rooms and is located next to a beach on the Adriatic Sea. 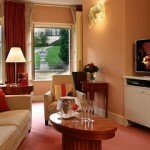 The hotel has individual rooms, double rooms, triple rooms and quadruple rooms. 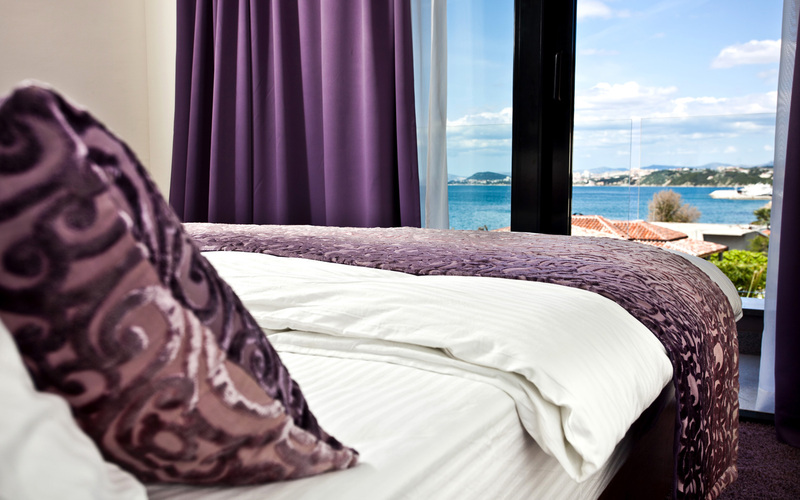 Each room has a double bed and purple lights, and the windows, which have views towards the sea, are decorated with thick curtains. The rooms are decorated in whites, greys and purples. 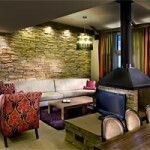 The furniture is made of light wood and each hotel room has colourful lightning and a flat screen television set. Each room has a desk and chair, an LCD television set and WiFi access. 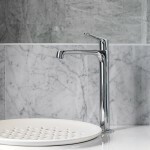 There are marble bathrooms. Part of the rooms have balconies with views towards the sea. The Individual rooms have a bed, an armchair and a balcony. Price is 85€ per night. 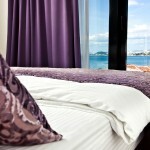 The Double Standard rooms have a double bed and a balcony with views towards the city. Price is from 110€ per night. 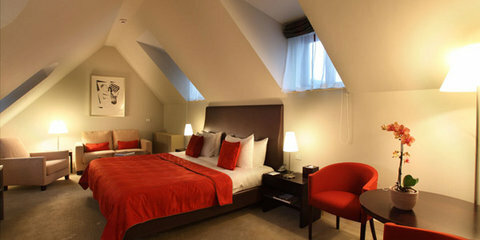 The Classic Double Rooms can be used as individual and double rooms. These rooms, furnished with a leather sofa and a desk, have views towards the sea and a price of 160€ per night. The Classic Triple rooms have a master bedroom with a double bed and a living room with a leather sofa bed. These rooms have a balcony with views towards the sea and a price of 190€ per night. The Classic Quad has a master bedroom with a double bed and a desk and a living room with two sofa beds. 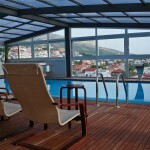 Each room has a balcony with views towards the sea and a price of 215€ per night. The hotel’s restaurant is located at the San Antonio hotel, the next door hotel known for its views of the Brac and Solta islands. The San Antonio Restaurant is located by the sea and guests will be able to enjoy views towards the sea while tasting traditional Mediterranean dishes and wines from the Dalmatia, Istria and Slavonia regions. The pool bar is located next to San Antonio’s Pool. The bar has a terrace with views towards the sea and the islands. Events can be organized in this bar. The Beach Bar is one of San Antonio’s bars and is located on the beach. 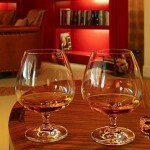 Guests will be able to enjoy cocktails and wines. The Aperitif Bar has a lounge and a terrace with sea views. The hotel’s pool and sauna are located on the San Antonio property. Next to the pool there is a gym and a spa where guests will be able to enjoy massages. Guests will be able to relax and enjoy the views. The rooms have air conditioning. Small pets are allowed in the hotel. There is a luggage storage room for guests. The hotel offers a transport service to and from the airport. Guest will be able to use the hotel’s conference hall, located in the San Antonio hotel. There are two conference rooms with WiFi which can be used for celebrations and other events. One of the halls can accommodate up to 35 guests and the other one can accommodate up to 140 guests. 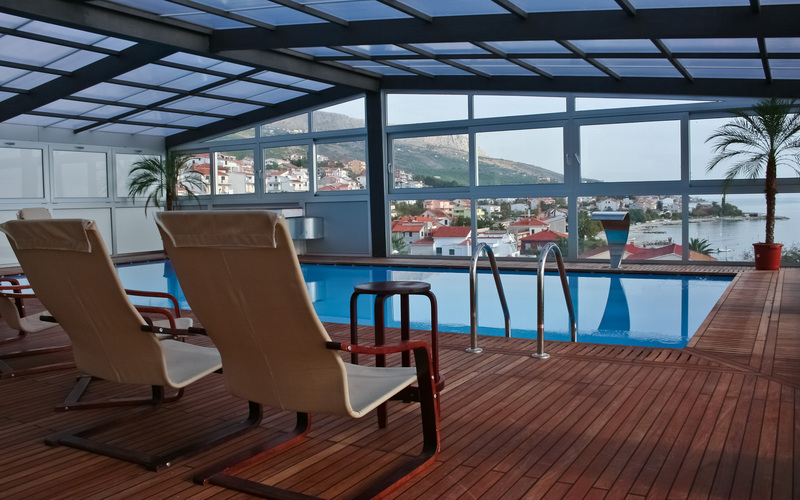 The hotel is located on Podstrana beach, a short distance away from the centre of Split. Near the hotel there is a beach where guests will be able to relax. In the nearby historic city center guests will be able to explore the museums and the Ancient Roman ruins. One of the hotel’s main attractions are its many activities. The hotel has large private beach. Guests can rent the hotel’s private yacht and sail around the nearby islands. Near the hotel’s beach there are several diving clubs, horse riding clubs and rafting rentals. Hotel Wanderlust is located in Singapore. The boutique hotel has four floors and each floor was designed by a team, where each floor has its own theme. This small hotel has four floors. 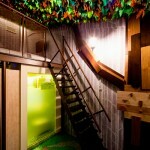 Each floor was decorated by a team of local designers and all the rooms on one floor follow a set theme. The hotel has 29 rooms. The rooms are double rooms with a bathroom and are decorated following a theme. There are iPod docks in the rooms. The lobby area and the ground floor are decorated following an Industrial Glam theme. The first floor has a hall decorated with rainbows, neon lights and a terrace with a mosaic jacuzzi. The second floor has a black and white design, a black hallway and white rooms decorated with murals and origami. The third floor has rooms decorated with small monsters. There are several types of rooms. The ten Pantone rooms are capsule rooms decorated in several colours. Each room is decorated with a neon sign with the title of a song about the colour of each room. The purple room has Jimi Hendrix’s Purple Haze neon sign. Price is from 123.30€ per night. 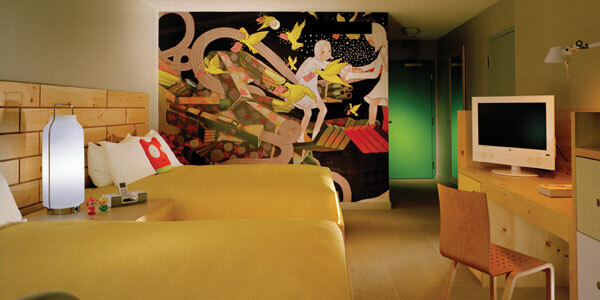 The Pantone Deluxe room is decorated in shades of yellow and above the bed there is a Yellow Submarine neon sign. There is a vintage iron bathtub in the bathroom and price is around 130€ per night. The eight Mono rooms have origami and pop decorations. The Mono Deluxe room has a large glass bathtub and a price of around 148€ per night. The Whimsical rooms are nine loft rooms. 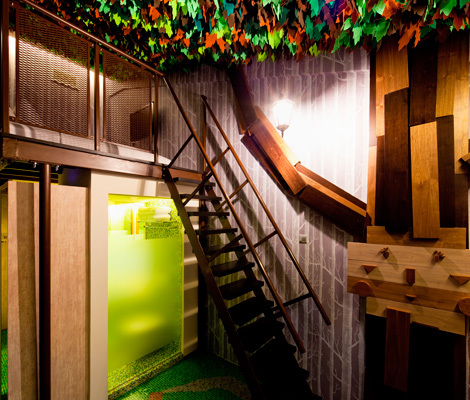 Each room has a theme and there is an ASCH room, a Bling room, a Space room, a Tree room and a Typewriter room. Each room has a bathroom with a bathtub and shower and price is around 173€ per night. 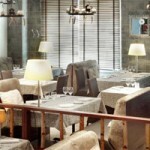 Cocotte is the hotel’s restaurant, decorated in an industrial style. The restaurant is known for its French dishes made from local ingredients. 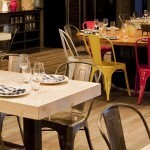 The restaurant has wood tables and colourful chairs. The tables are long shared tables and most dishes served at the restaurant can be shared. Guests will be able to enjoy traditional French dishes. Each room has a guide about the region and the activities offered near the hotel. The guide mentions the services that the hotel offers to its guests. The guide has a map that shows guests the location of the hotel, which monuments are nearby and where the closest transport link is. The guide has a metro map and recommendations of bars, restaurants and shops. The hotel is located in the Little India neighbourhood of Singapore. The building used to be a school. Guests will be able to explore Little India and enjoy its ethnic restaurants. The hotel offers tours around the city. Guests will be able to explore the city and its main monuments and museums by bus. The Duck Tours are another way of visiting the city, its bay and its coast in an amphibian vehicle. There is a large Ferris wheel a short distance away from the hotel. This Ferris wheel, the Singapore Flyer, is known for its views towards the city and the sea. The Santa Claus Hotel is located in Rovaniemi, Lapland, in Finland. The hotel organizes many activities and outings for the technicians stationed near the Arctic Circle. The hotel has 167 that vary in décor and price. 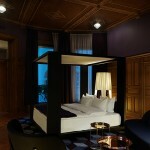 Each room has three meter ceilings, a large double bed, several windows and a private bathroom. The décor is not as festive as one would expect for a Santa Claus hotel, and this hotel is known for its centric location and easy access to the northern regions. The hotel is adapted to guests with mobility issues and there are special large ground floor rooms for them. Part of the rooms were designed for families that travel together. There are 63 standard rooms, 61 superior rooms, 27 superior extra rooms, 11 deluxe rooms and six suites, many with them with their own balcony and sauna. Price is around 170€ per night for a double room. The hotel favours ecological tourism by having energy saving light bulbs and water saving facilities, and recycling many resources. The Santa Claus Suite has a large room with a kingsize bed and a bathroom with its own jacuzzi and sauna. This suite has a balcony and can be connected to a double room to create a larger family suite. There is Internet access, a television set, a safe, a minibar, climate control, an electric water boiler, an ironing set, a trouser press and bathrobes for guests in the bathroom. The Gaissa Restaurant specializes in traditional Lapland dishes. Next to it guests will find the Bar and Grill ZoomUp, where guests will be able to enjoy local delicatessen and grilled meat. 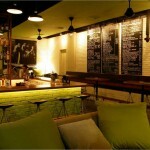 The Café and Bar ZoomIt is known for its large varieties of coffees and other warm beverages. Guests have access to the hotel’s large sauna, a tradition in this region. The price of each sauna session is included in the room’s price. The hotel can be rented for conferences and events. There are several conference rooms equipped with desks, chairs and whiteboards. WiFi is available at the hotel. In the lobby there is an Internet room with several computers. The Santa Claus Conference Centre is located on the hotel’s ground floor. There are eight conference halls with a maximum capacity ranging between 20 and 100 people. Three of the conference rooms can be connected to the largest rooms in order to create more space and a capacity of up to 300 people. The conference centre has direct access to the garage, which has two floors and can fit several trucks. This hotel is a Film Friendly hotel, which means that both the hotel staff and the hotel’s infrastructure are prepared to handle filming equipment. Filming crews can stay on the same floor as their equipment, and whole floors can be rented for larger crews. Guests part of a filming crew have access to the hotel’s restaurant at later hours, and if filming takes longer than expected the hotel can provide a catering service in the conference room. 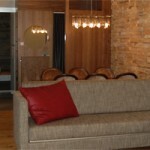 The hotel is located in the centre of Rovaniemi, the capital of Lapland. A short distance away there are several historic landmarks and monuments, and the hotel is near a major shopping street. The Kalotinlinna shopping centre is located nearby. Guests will be able to enjoy trips around Lapland. Several activities are organized depending on the season, and guests will be able to enjoy skiing and trips to nearby cities, one of which is said to be the city where Santa lives. The city is one of the closest cities to the Arctic Circle. Guests will be able to enjoy the many trips to the Arctic Circle organized by the hotel. The Le Monde Hotel is located in Edinburgh, in Scotland. This hotel’s theme is travel around our planet, where each room is a region to explore. 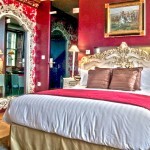 In this hotel each room is decorated in its own style, with rooms representing several countries and regions. There are several types of rooms, and each one of the eighteen suites is dedicated to a city. All rooms are double rooms with a private bathroom and a cascade shower, a large range of bathroom amenities, WiFi and a minibar with a coffee and tea making machine. There is a large 42 inch plasma television screen in each room, and guests will be able to rent DVDs and Nintendo Wiis in reception. Guests will be able to enjoy breakfast in their rooms. 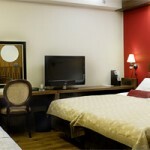 There are are several types of rooms, and guests can stay in Superior room, Executive rooms and Junior suites. The superior rooms reflect the oddities of the city they are dedicated to. The Miami room has Art Déco décor. 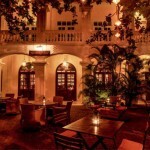 La Habana room has a Caribbean décor with a colonial touch. The Barcelona room has a bohemian design with views towards Rose Streets. The Rio room is all about the Carnival, and has access for guests with mobility issues, and is a colourful room decorated with a Christ of Redemption painting. Saint Petersburg room reflects the imperial era of Catherine the Great, with ice blue and silver decorations. The Beijing room has oriental wallpaper and a large mural of a Chinese dragon painted by hand. The Executive room are larger and have a kingsize bed and a desk and chair. 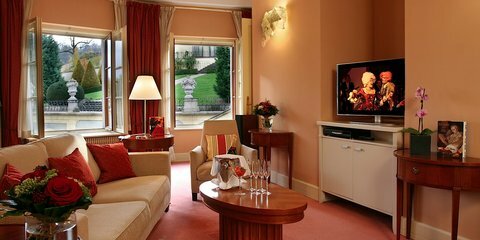 The Milan room is a fashionable room with large windows and walls covered by mirrors. 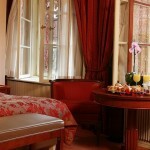 The Paris room is decorated with antique furniture covered by soft red fabric. 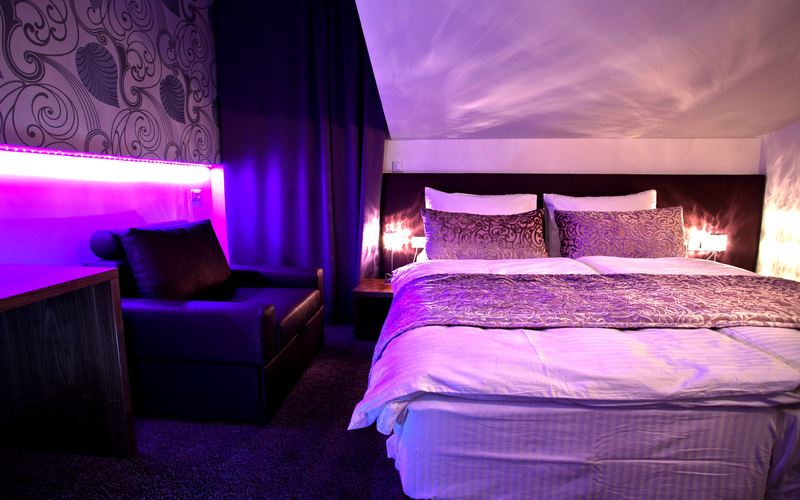 The Reykjavik room has a decorative glacier in the centre and follows a Scandinavian décor. The London room is a grand room with heavy wooden furniture and engravings representing the city. Dublin is a room honouring the Temple Bar district and is decorated in greens. 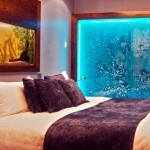 The Atlantis room features an acuatic décor, art pieces in shade of blue and an aquarium with tropical fish. 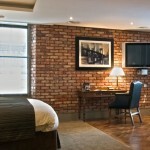 The Junior Suites are large suites with a kingsize bed and a lounge. The New York suite is a designer loft with dark wooden furniture, a brick wall, leather sofas and wood floors, and a bathroom with a double shower. Los Angeles is a suite with white leather furniture, walls decorated with the faces of movie stars, a Hollywood star plaque and a bathroom with a bathtub and a shower for two. 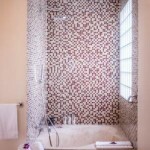 The Sydney suite has an aboriginal style mural, leather sofas, a bathroom with a sunken bath and a cascade shower and a large window. 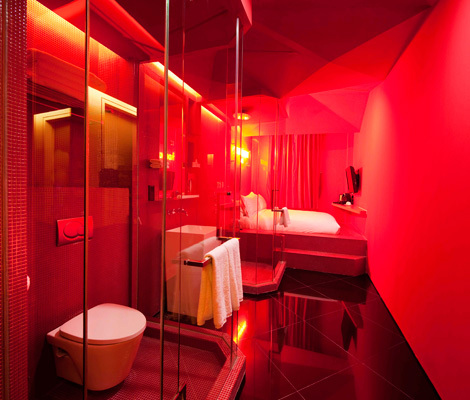 Tokyo is an oriental style suite with dark furniture and framed kimonos hanging on the walls, and has a black bathroom. The Cairo suite is a spacious suite with an iron fence that leads to the bathroom, which has a sunken bath for two people and a cascade shower, and there is a lounge area with leather decorations. The Marrakesh suite is decorated in shades of ochre and has North Africa furniture, with a bathroom with a sunken bathtub, a large window and a lounge. In this hotel there are several bars and restaurants, each one of them dedicated to a region and specializing in the traditional food of that region. Guests will be able to enjoy traditional Scottish dishes and international food. In the bars and restaurants guests will be able to organize dinners and events for groups, and each bar and restaurant is dedicated to a region. 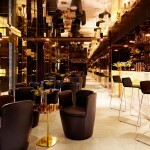 In Paris guests will be able to savour the French haute cuisine accompanied by cocktails in a chic setting. For a business lunch guests can visit imperial Vienna, where wine tastings are organized. 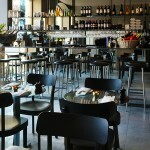 Milan is known for its breakfasts, Italian aperitifs and freshly ground coffee. In the Shanghai Club guests will be able to enjoy energetic music, oriental style and technology. Before eleven p.m. the club can be rented for private events, and after it becomes one of the city’s most visited venues. 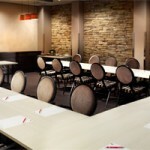 The hotel can organize conferences and events. The hotel’s conference rooms have a capacity for 100 people sitting and around 450 people standing. 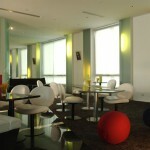 There are more than twenty plasma screens, several projectors that can even project on the floor and WiFi. The hotel is located in the centre of Edinburgh, near George Street, one of the city’s main streets. In August guests will be able to enjoy the Edinburgh Festival. A short distance away guests will find Edinburgh Castle, where the cannon goes off at one in the evening, and many other historical monuments in the Old Town. The tourist bus that tours the city stops next to the hotel. 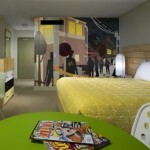 The Tomo Hotel is located in San Francisco, in the United States. 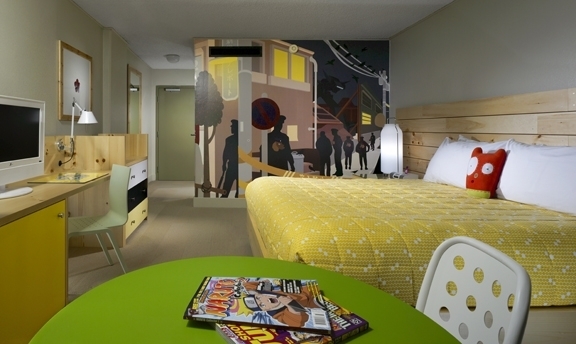 The hotel has a Japanese theme with colourful anime murals and Japanese décor. The Tomo Hotel is part of the Best Western Hotel Chain. This hotel was renovated recently and is now a small hotel with a Japanese decoration. The hotel has 125 rooms spread around eight floors. 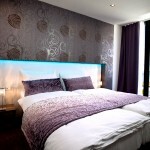 Each room is a double room with a private bathroom, a double bed, murals on the walls and a flat screen television. In each room there are iPod docks, a desk with an ergonomic chair, a safe, bathroom amenities, an iron with an ironing board and views towards Japantown. 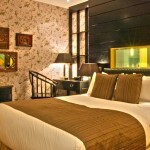 The Deluxe Queen and Deluxe King rooms are large room with two queensize beds and a kingsize bed respectively. 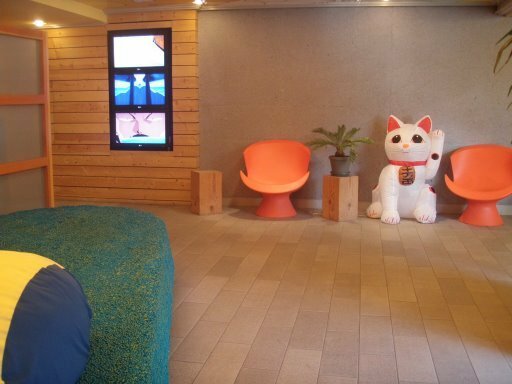 There is a desk and a chair, a large mural decorated with Japanese cartoons and views towards the hotel’s courtyard. 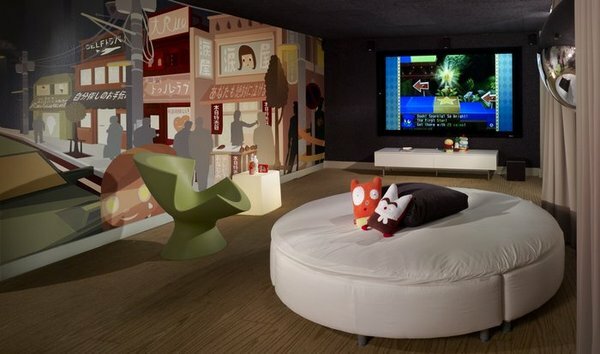 The Tomo Queen Rooms are larger, with a living room and a dining area, all of them decorated with characters from anime and manga. The Balcony Queen Rooms are located on the hotel’s top floors and have a large balcony with views towards the city. The Players Suites are the hotel’s designer suites. 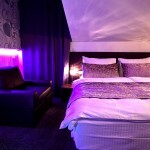 Each one of these suites has two queensize beds, a large high definition LCD screen, a Nintendo Wii and a Playstation 3. 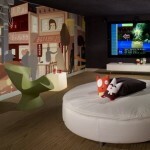 In these suites guests will be able to enjoy movies in their own small home cinema and play videogames. In the Mum’s Restaurant and Bar guests will be able to savour traditional Japanese food. One of the restaurant’s dishes is shabu shabu, a meal cooked in front of the guests. The dishes are served accompanied by several sauces and spices for guests to choose from. There are several conference rooms at the hotel. The three conference rooms are equipped with audio and video equipment and can be used for private events. The hotel is located in the Japantown neighbourhood of San Francisco. There are many traditional shops that sell kimonos and many varieties of sushi restaurants. There are several spas close to the hotel where guests can enjoy traditional Japanese treatments. A short distance away from the hotel guests will find the city’s main attractions, including Chinatown, the Golden Gate Bridge, Union Square and other known monuments. The hotel is accessible by public transport and has a easy access to the airport. The Aria Hotel is a musical hotel located in Prague, in the Czech Republic. This hotel is dedicated to music, with a grand piano in the main hall and mosaics with musical notes on the walls. This hotel is known for its dedication to music. Many artists, singers and music virtuosos have stayed at this centric hotel. In the hotel there are art pieces dedicated to compositors, ranging from Dvorák and Mozart to the singers Elvis Presley and Billie Holiday. The hotel’s 52 rooms have their own theme. Each room is dedicated to a musical style and there are rooms dedicated to singers. There are several types of rooms, 28 Deluxe rooms, 17 Junior suites and seven Luxury Suites. The hotel has four floors and each floor has a theme, the four floors being dedicated to classical, opera, jazz and contemporary music. 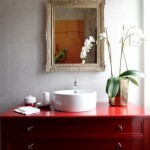 Each room is a double room with a bathroom and is decorated with antiques. There are pieces of art, magazines and a large flat screen where guests can browse the biography of the composer their room is dedicated to. In each room there is Internet access, a minibar, a television with a DVD, loudspeakers and an iPod loaded with more than 250 songs, which range from the chants of Gregorian monks to the latest hits. The bathrooms have a bathtub, bathrobes, Molton Brown amenities and a telephone. The hotel has a rooftop terrace, the Roof Garden Terrace, where guests can enjoy a snack with views of the city. The Coda restaurant is one of the city’s most visited restaurants. This art deco restaurant has views towards the historic center, the Palace Gardens and Prague Castle. Guests and visitors can enjoy live concerts while they enjoy their meals served on plates decorated with caricatures of composers. At the Prairie Salon guests will be able to enjoy relaxing and revitalizing treatments. There are special facial treatments for men and women. The hotel’s gym has several treadmills, a weight lifting area, a sauna and a steam room. Guests who stay at this hotel will be able to enjoy live music. In the Screening Room there is space for around twenty and thirty people, depending on the room’s layout. The Screening Room can be used as a meeting room, and the Executive Boardroom is a smaller meeting room for a maximum of ten people. This room has a conference phone, loudspeakers and a whiteboard. The Music Box is a library and a recreation room where cultural evenings are organized. The room has several sofas and can accommodate up to six people, and has a high definition plasma television screen, a DVD player, loudspeakers and an overhead projector. There is a large musical library where guests can rent CDs, DVDs, videos and a large selection of musical literature. The Music Salon is decorated like a small theater, with golden and red curtains and furniture. There are leather armchairs and sofa and a chimney, with large bookcases filled with musical literature, a place where guests can relax and enjoy a bite. The hotel’s building was built according to the architectural style of nearby buildings. The path between the iron gate and the hotel’s entrance is decorated with an Italian mosaic representing singing Gregorian monks. Next to the hotel guests will find the Vrtbovska gardens, one of the city’s most ancient baroque gardens. In these gardens there are several terraces with views towards the Old Town. The capital of the Czech Republic is one of the most touristy destinations in the region. This city is known for its Gothic architecture and its history. The hotel’s staff can book tickets for the latest musical events. 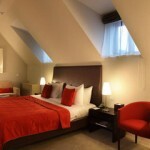 The hotel is located in the center of the city, in the Mala Strana neighbourhood. This neighbourhood is filled with ancient baroque palaces, historical churches and gardens. Some of the nearby attractions and landmarks include Prague Castle, the Charles bridge over the river Vltava decorated with mostly baroque statues, Saint Nicholas Cathedral and the Royal Gardens. There are many cultural landmarks and monuments, and guests will be able to visit the Rudolfium, where guests can enjoy a performance by the Czech Republic’s National Orchestra.